The global superhydrophobic coatings market is fragmented and immensely competitive, making it well-poised to register a double-digit growth rate during the forecast period by revenue as well as volume. Although the need for high capital investment might appear as a major challenge for new entrants, innovation in product solutions and technologies present several opportunities for them in the superhydrophobic coatings market. The thriving automotive, construction, and consumer electronics industries have fueled the demand for superhydrophobic coatings over the years. The market is projected to rise from a value of US$2.90 mn in 2015 to reach US$37.1 mn by 2024 at an astounding CAGR of 34.3% during the forecast period. By volume, the superhydrophobic coatings market will expand at a 37.3% CAGR from 2016 to 2024. Superhydrophobic coatings find application in sectors such as electronics and telecommunication, textile and leather, building and construction, automotive, healthcare and medical, optical, and power generation. In terms of demand, the electronics and telecommunication sector accounted for approximately 32.0% of the superhydrophobic coatings market in 2015. The segment is expected to witness significant growth during the forecast period owing to the increasing applications of superhydrophobic coatings in consumer electronics, semiconductors, and other electronic components. The building and construction and automotive sectors are also a prominent end users of superhydrophobic coatings. Superhydrophobic coatings are environment-friendly and highly compatible with concrete, masonry, ceramics, and composite substrates. These coatings can also be used for waterproofing applications on ceramic floor and wall tiles, cement walls, and roofs in exterior and interior constructions. Textile and leather is anticipated to be the fastest-growing end user during the forecast period, presenting lucrative options for players. The growing need for protective, dirt-resistant clothing in the military sector and self-cleaning apparels for daily use is likely to drive the demand for superhydrophobic coatings in the textile and leather industry. The global market for superhydrophobic coatings comprises North America, Latin America, Asia Pacific, Europe, and the Middle East and Africa. In terms of volume, North America led the superhydrophobic coatings market in 2015, followed by Europe. Robust development of the electronics and telecommunication industry and the recovery of the building and construction sector in North America, especially in the U.S., are the key drivers fueling the superhydrophobic coatings market in the region. The scenario is likely to be similar in Europe in the near future. Countries in Western Europe such as Germany and the U.K. are projected to be the key consumers of superhydrophobic coatings in during the forecast period. Asia Pacific is forecast to exhibit the fastest growth from 2016 to 2024 owing to the rapid industrialization of the consumer electronics sector and rising residential construction and infrastructure activities in the region. This scenario is estimated to be reflected in China, India, and several ASEAN countries during the forecast period. Latin America and the Middle East and Africa are both anticipated to present major opportunities for players in the superhydrophobic coatings market. P2i Limited, Cytonix, LLC, The Sherwin-Williams Company, DryWired, LLC, UltraTech International, Inc., Sto Group, Surfactis Technologies, Nanex Company, NTT Advanced Technology Corporation, NEI Corporation, Lotus Leaf Coatings, Inc., Rust-Oleum Corporation, Aculon, Inc., and Artekya Ltd. are some of the leading players in the global superhydrophobic coatings market. Superhydrophobic coatings are nanocoatings that are manufactured by using nanoparticles of metals and metal oxides, carbon nanotubes, and graphene as key raw materials. These coatings exhibit outstanding water repellent property and provide protection from microbial growth, corrosion, dust, oil spills, water, and other liquids. 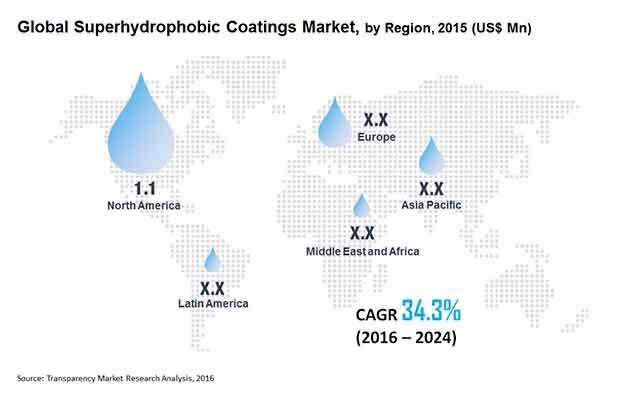 Electronics & telecommunication, automotive, textile & leather, building & construction, and medical & health care are the major end-user segments of the global superhydrophobic coatings market. In terms of volume, electronics & telecommunication segment held the largest share of the superhydrophobic coatings market in 2015. However, textile & leather is anticipated to offer considerable growth prospects during the forecast period. The outlook for the superhydrophobic coatings market appears positive in major countries such as the U.S., Germany, and China during the forecast period, owing to the intensifying consumption of these coatings in electronics & telecommunication, building & construction, and automotive industries. The report estimates and forecasts the superhydrophobic coatings market on the global, regional, and country level. The study provides forecast from 2016 to 2024 based on volume (tons) and revenue (US$ thousand) on the global and regional level. Furthermore, the market estimates on the country level have been provided from 2016 to 2024 based on volume (kilogram) and revenue (US$ thousand). The study offers a broad view of the superhydrophobic coatings market by dividing it into key end-user segments such as electronics & telecommunication, building & construction, textile & leather, automotive, medical & health care, and others. End-user segments have been analyzed based on historic, present, and future trends, and the market has been estimated from 2016 to 2024 in terms of volume (tons) and revenue (US$ thousand) on the global and regional level. For country level, the market has been estimated in terms of volume (Kilogram) and revenue (US$ thousand) from 2016 to 2024. Regional segmentation includes current and forecast demand for superhydrophobic coatings in North America, Europe, Asia Pacific, Latin America, and Middle East & Africa (MEA). Additionally, the report includes country-level analysis in terms of volume and revenue for end-user segments. Key countries such as the U.S., the U.K., France, Germany, Italy, Spain, China, India, Brazil, and South Africa have been included in the research study. Market segmentation includes demand for individual end-users in all regions and major countries of each region. The report includes a comprehensive value chain analysis that provides a widespread interpretation of the market. Furthermore, the value chain analysis provides thorough data about value addition at each stage of the value chain. The report covers drivers and restraints of the superhydrophobic coatings market as well as their influence on demand during the forecast period. The report also includes the study of opportunities in the superhydrophobic coatings market at the global level. The report comprises Porter’s Five Forces Analysis to estimate the degree of competition in the global superhydrophobic coatings market. It includes a qualitative write-up on market attractiveness analysis, wherein end-users and countries have been benchmarked based on their attractiveness, growth rate, market size, raw material availability, profit margin, impact strength, technology, and competition. Other factors (such as environmental and legal) have also been evaluated to derive general attractiveness of the market. The report further comprises the price trend analysis of superhydrophobic coatings and their raw materials, which primarily include nanoparticles of titanium dioxide, carbon nanotubes, silica, and zinc oxide, from 2016 to 2024, keeping 2015 as a base year. In-depth interviews and discussions with a wide range of key opinion leaders and industry participants were conducted to compile this research report. Primary research represents the bulk of the research efforts, supplemented by extensive secondary research. Key players’ product literature, annual reports, press releases, and relevant documents were reviewed for competitive analysis and market understanding. This helped in validating and reinforcing our secondary research findings. Primary research further helped in developing the analysis team’s expertise and market understanding. The report covers a detailed competitive outlook that includes company mapping based on availability of their products for various end-users and coating surfaces/substrates. Furthermore, the report includes profiles of key players operating in the global market. Rust-Oleum Corporation, Aculon, Inc., Artekya Ltd, Cytonix, LLC, NEI Corporation, NTT Advanced Technology Corporation, Lotus Leaf Coatings, Inc., DryWired, LLC, Nanex Company, P2i Limited, Sto Group, Surfactis Technologies, The Sherwin Williams Company, and UltraTech International, Inc., are the major players profiled in the report. Company profiles include attributes such as company overview, number of employees, brand overview, key competitors, business overview, business strategies, recent/key developments, acquisitions, and financial overview.